This might seem an esoteric selection for a top ten list, but one of the many interesting things about it is that it's not: Diane Arbus has always been popular. Her magazine work, done for money, did well; her Aperture monograph is among a tiny, select handful of "evergreen" photo books that just keep on selling, year after year; seven million people saw the posthumous traveling retrospective of her work; and though she might seem the last person who could ever make money doing high-society portraits for pay, she did. 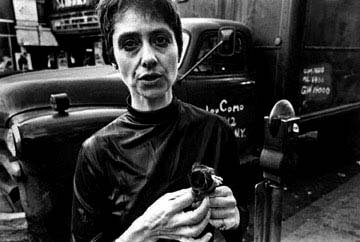 It helps for an artist to know what she's about, and Arbus really knew. Her work from start to finish is an extended investigation into the meaning of self. She was relentless about it: she's described as photographing aggressively, in an almost hungry or predatory way, as if it were some sort of surreal substitute for climbing into the skin of her subjects. She's best known, of course, for her take on "freaks" as "natural aristocrats," because they were born into their life's trial and carry it with them everywhere, but photographs of acknowledged freaks account for only a small portion of her work. All of her pictures, however, in one way or another, vector in on the peculiar trials—the strangeness, even the horror, really—of being a consciousness, a self, trapped inside a particular animal body with its particular compulsions and restrictions and stuck with the strange, sad, or brave ways we have to settle on presenting it to the outer world. Twins aren't freaks. But that conundrum of a distinct duplicate self has always had a natural fascination for anyone curious about identity. 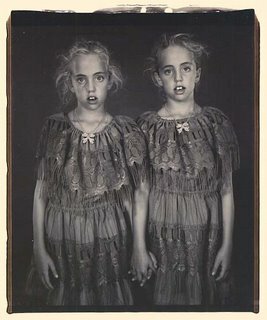 Like almost all of Arbus's pictures, her portrait of Colleen and Cathleen Wade at age seven (taken, coincidentally, the same year that Warhol first mass-produced his Marilyns) seems simple, even straightforward. It is not. 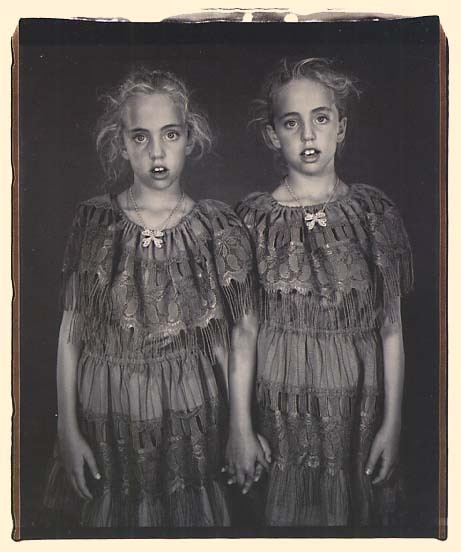 That is made most clear by a comment not from any harrumphin' art critic, but from the girls' father: "We thought it was the worst likeness of the twins we'd ever seen. I mean it resembles them, but we've always been baffled that she made them look ghostly. None of the other pictures we have of them looks anything like this." 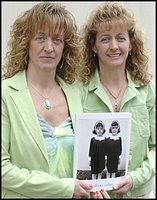 That quote comes from David Segal's great May 2005 Washington Post article about the twins, as does Helayne Seidman's picture of the two today (right) with what their father calls their "401(k)"—the print Arbus sent the family as a courtesy, now worth hundreds of thousands of dollars. (Maybe millions, eventually, considering its unique provenance). 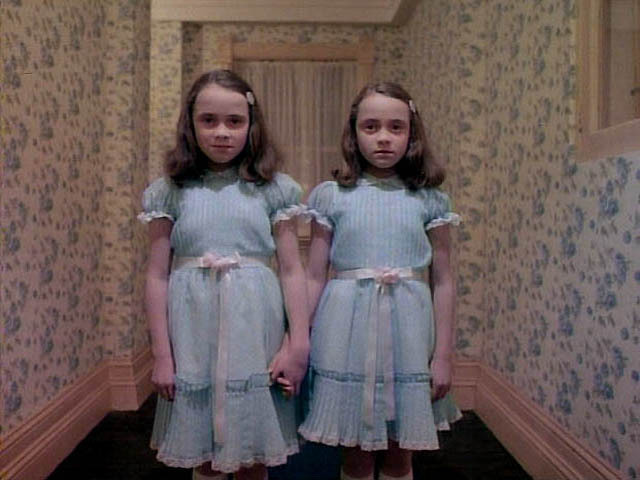 There are a dozen memorable lines in Segal's down-to-earth article, including the laugh-out-loud funny one that the twins are the "least creepy people" you'd ever want to meet. 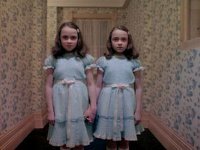 Not bad for a pair whose picture is said to have inspired the one of the most deceptively scary (and memorable) scenes in Stanley Kubrick's famous horror film The Shining. Arbus is probably the photographer whose biography (unofficial and provisional though the published one is) is more intriguing than any other's—and that's saying something. At the very least, the web of connections fascinates us. A student of Lisette Model, she was also mentored by Richard Avedon, who then had a long and still somewhat mysterious relationship with Diane's daughter Doon. Her husband, Allan Arbus, whom she met at 14 and married at 18 (and separated from at 36 or so, in 1959), later played Dr. Sidney Friedmann—a psychiatrist—on the TV show M*A*S*H. And one of Arbus's high-society portrait clients was Gloria Vanderbilt, the heiress who popularized boutique blue jeans. 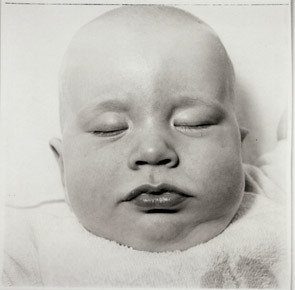 "She took a remarkable portrait of Gloria Vanderbilt's sleeping baby son, Anderson Hays Cooper, for a Harper's Bazaar Valentine issue," biographer Patricia Bosworth says. "In this truly astonishing picture, the infant resembles a flat white death's head—eyes sealed shut, mouth pursed and moist with saliva. When Gloria Vanderbilt saw the photograph, she forbade Bazaar to publish it, but eventually she changed her mind and this stunning image opened Diane's retrospective at the Museum of Modern Art in 1972." The infant—grown, of course—is now an announcer on CNN. In a medium that is almost perversely amorphous and upon which it is so notoriously difficult to impose a style, virtually every Arbus radiates, distills, vibrates Arbus ("we've always been baffled that she made them look ghostly"). She's the best example and possibly even the origin of the idea that great photographers take every picture of who's behind the camera as well as what's in front of it. In psychological parlance, she may have had "thin borders" between herself and others. Saying that, it's important to remember too what a profound sympathy she had—a rare power of sympathy that gave her an opening into the interior worlds of others, even strangers. What to most of us is an opaque wall was to her a wide window. Mary Ellen Mark's 1969 portrait of Arbus (left) shows a woman with an undeniable intensity, but also a haunted look that does seem, in retrospect, to fortell her suicide. The same sense haunts her work. It's a truism that certain peoples believe there is life in everything on Earth, every rock and breath of wind. But there is also a faint sinister deadness in everything in the world, which photography seems morbidly adapted to reveal; by not just acknowledging but pursuing the surreality lurking behind reality, Diane Arbus cracked the medium's ribs. Her influence, deathless, haunts us still. Mary Ellen Mark, Heather and Kelsey Dietrick, 2002. * Please come back for Number 7, next Tuesday. Many years ago I was reading (or whatever it is called when it's a photobook) a book of her work, and I came upon a picture of a boy with rage on his face. I found myself thinking: "hm, so what is disturbing about this one." And then I saw it: he had a (toy) hand grenate in his hand. My gawd, living in her head must have been dreadful. One of the best appreciations I have ever read of Arbus's work. The recent "Revelations" retrospective was a revelation to me, who always thought (like Eolake) she just shot depressing pictures of society's outcasts. She was in fact, as you say, a supreme master at capturing the way all sorts of people "stream" themelves to the outside world, and the results were mesmerizing. Bravo, Mike! I guess that I can't argue with this choice, although I do not personally find her work interesting. 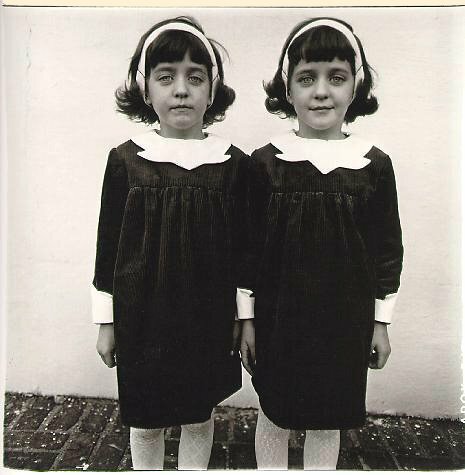 Arbus was the apothiosis in the progression of in-your-face flash. From the flash powder shots of Ries and Hine, through the flash bulb era of Weegee and a thousand sports and events photographers, and finally to the blatent strobe blasts of celebrity shooters and "spontaneous" enviromental portraits. She took a tradition and transformed it into a genre. This was probably the sentinal image of that change. What a wonderful, poetic synopsis! Thanks! In looking at Diane Arbus' photographs, I am amazed by just how exposed--open, naked, vulnerable--her subjects appear in the pictures. I want simultaneously to look at them and to look away. Arbus makes me uneasy. A hint of Victorian morbid curiosity, existential angst a La Nausée. It's as if having gone to the precipice of human self-repulsion and surviving, she decided to come back and rub our noses in it - it sometimes smells like bourgeois guilt. Bracing to be sure, but I frequently feel like showering after a prolonged exposure to her work. Every time I see one of her pictures I think of a lecherous Uncle's shoe box hidden in the back of a closet. Guess we'll have to see what Hollywood makes of her (gasp!) life.